The majestic Shiva (right) stands in a relaxed posture and would have leaned upon the head of his bull, known as Nandi or Vrisha, which is now missing. The god's recognizable attributes include his elaborate hairstyle, in which his long matted hair is piled up on top of his head to form a crown, his elaborate jewelry, and his armbands. His wife and companion, Parvati (F.1982.2.2.S), is the embodiment of feminine beauty and grace. This manifestation of Shiva is called Shiva the Bull-rider. The earliest such representations featured the god and his bull, but over time Parvati became a part of the tableau. Though the bull is now missing, Shiva and Parvati remain an impressive couple. The couple wears lavish jewelry, sacred threads across their chests and crowns in the forms of temple spires. 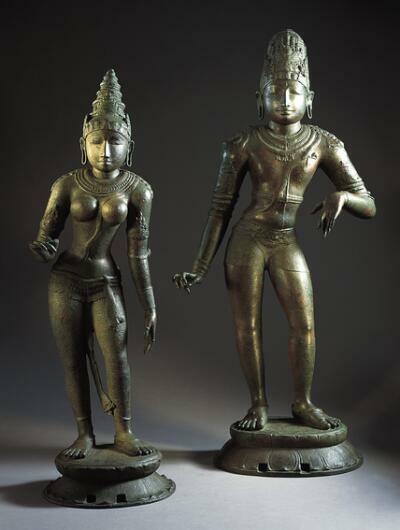 It is possible that the bronzes were donated to a temple by the Chola emperor Rajaraja, who may have been the human model for this and other images of Shiva. In any case, the unusually regal air of this Shiva may be intended to recall the emperor. Notice how Parvati bends in his direction, acknowledging him with her body. His weight, however, shifts away from her, emphasizing his relationship with the bull on which his bent arm once rested. At the height of the annual ten-day Shiva festival in south India, the holy couple and the bull are carried through the streets in procession.